Ok, so you've just had a big BBQ, and now you have lots of leftover corn on the cob, and baked potatoes, right? Well, at least that was the situation I was in after a recent get together. With money as tight as it is these days, it just makes no sense to throw away leftovers, or leave them in the fridge only to throw them away a week later, right? So I figured, why not breathe new life into them and make a casserole? Waste not want not! I had several ears of corn on the cob, and several Grilled Potato and Onion Bundles, so I just threw everything into a big bowl with some other ingredients and voila! New dish! I love the sweetness of the corn with the sharpness of the cheese. Fabulous! And the corn flakes are the perfect crunchy topping. It actually turned out to be a much lighter casserole than one might expect because I used a low fat cheese and also skim milk. Still very hearty, but not quite as "stick to your ribs". Know what I mean? So the next time you have some leftovers, don't throw 'em away! You can always create something else with them. Try it! Saute onions and mushrooms with a little oil over medium heat until lightly browned. A lot of liquid will come out of the mushrooms, but just continue to saute until it evaporates and everything begins to brown. In the meantime, par boil and drain the potatoes, just to give them a little head start. (clearly, you don't have to do this if you're using leftover baked potatoes). Now simply place all ingredients except the corn flakes in a huge bowl and stir to mix. Pour mixture into a lightly sprayed 9x13 casserole dish. Place dish in heated oven. Baked for about 40 minutes. 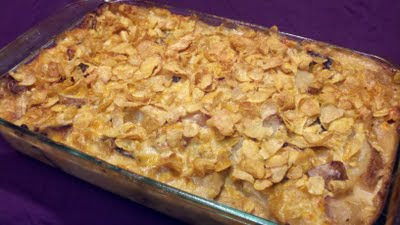 Top with corn flakes (as much as you like). Bake for 5-10 minutes longer. The amounts are just guidelines. I really had no exact measurements. I was just using what I had leftover. Basically, if you like a lot, add a lot. If you're not a fan of mushrooms, simply omit them and use a different kind of cream based soup. Cream of chicken, cream of broccoli, cream of celery, all perfect. Add anything you like! Any veggies would work. Broccoli, asparagus, etc. You could also had some shredded rotisserie chicken or even diced ham. Yum. If you're not a fan of cheddar, add any kind of soft cheese that melts nicely. Actually, I was originally gonna use Swiss cheese, but cheddar is what I happened to have on hand. You can also substitute buttered bread crumbs or french fried onion rings instead of the corn flakes.